Welcome to the Autumn edition of County Jottings. Our golfing season is complete. Our Full County, Colts and Seniors sides were unbeaten and won their respective divisions of the English Golf Union South Eastern Group North of the Thames Leagues. Additionally the Seniors won the Southern Counties Foursomes at Cotswold Hills. The Colts gained a very creditable half against Kent, who had home advantage, in the League play off at Littlestone in mid October. In dreadful weather at South Beds at the end of October, the County just lost out to Hampshire for the Daily Telegraph Salver. Congratulations to all the winners of our Championship and Trophy Events especially Ashley Walton (Frilford Heath) who won the Amateur Championship at Beaconsfield in their Centenary Year. Congratulations also, to those who represented the County at Junior, Colts, Senior levels and County levels and to Steve Lewton (Woburn), David Addison (Parasampia) and Mark Housego (Wycombe Heights) who received their County Colours this year. Finally a special thanks to all the Clubs and Members who willingly gave up their courses for our events this year. We are appreciative of your support of County Golf. Our 2003 fixture list appears on the following pages and will be updated as soon as provisional dates and venues have been confirmed. Please visit our website to obtain details of our events and to download entry forms. These will be available from early January. Starting Sheets and Results are regularly updated throughout the season and we hope you find this service useful. Our website also contains details of all the Clubs within BB&O and contains links to other useful websites. Please let us know if you would like us to include any other information. The Half-Year Council Meeting took place at Weston Turville GC on 17th October. Over 40 Secretaries and Club Representatives attended the meeting. These following appointments were approved at the meeting. After a buffet lunch the delegates enjoyed excellent weather and played the traditional Greensome Foursomes which was won by Mike Miller and Ian MacCaskill (Denham) whose 42 points just pipped the team of Tim Clutterbuck and Keith Wilcox (Beaconsfield). The winners of the Half Year Council Meeting Ian MacCaskill & Mike Miller. The third League match of the year, against Middlesex, took place at Magnolia Park on 4th August. The team got off to an excellent start in the morning and we took a comfortable 3½ - ½ lead into lunch after the foursomes. David Addison (West Berkshire) and Tom Lawson (Ellesborough) again showed what a good pairing they are as they had another big win by 6/5. The afternoon singles developed quickly as our players got off to good starts, the best of which came from Tom Lawson who opened up with 5 straight birdies to go three up. Stephen Lewton (Woburn) and David Addison were also piling on the pressure and these three players would eventually finish 20 under par for the 42 holes they played and resulted in three big wins and the match win. Later in the afternoon, Ashley Walton (Frilford Heath) and Steve Barwick (East Berkshire) also had comfortable wins before Clive Bowler (Oxford City) won on the last to give the side a 9½ -2½ win. 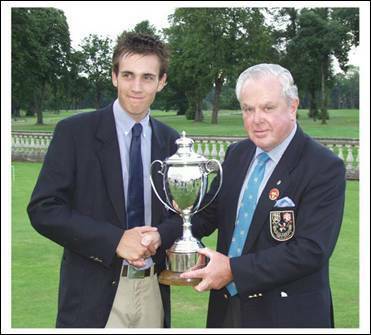 Captain Matt Briggs (Frilford Heath) is now looking forward to the final match of the season against Essex at Orsett. A draw will secure the League title although we will be looking to finish the season in style with a win. 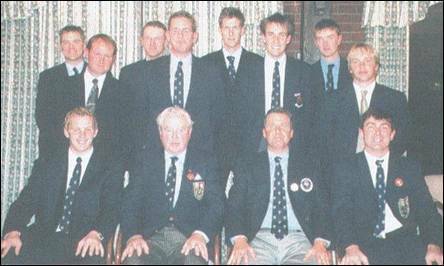 Team at Magnolia Park: David Addison (West Berkshire), Steve Barwick (East Berkshire), Clive Bowler (Oxford City), Kevin Freeman (Stoke Park), Mark Housego (Gerrards Cross), Tom Lawson (Ellesborough), Stephen Lewton (Woburn), Ashley Walton (Frilford Heath). The fourth and final League match of the year, against Essex, took place at Orsett Golf Club on 25th August. Essex is traditionally our strongest opponents in the League but our calculations showed that a single point from the day’s 12 games would give us the League Title. David Addison (West Berkshire) and Tom Lawson (Ellesborough) provided that point as early as 11am with an outstanding performance, at 6 under par for 11 holes, that saw them win by 8/7. Not to be outdone the remaining pairings all took their games and we went into lunch with a 4-0 lead and as EGU/SE Group North of the Thames League Champions. 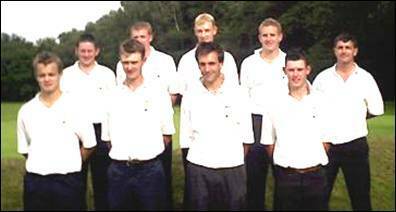 The County Captain, Matt Briggs (Frilford Heath), wanted to take the League Title undefeated and he urged the players on to ensure the match win. With incredible scoring, Tom Lawson (Ellesborough), David Addison (West Berkshire) and Stephen Lewton (Woburn) won the top three singles by large margins and were collectively 20 under par for the 42 holes they played; on average a birdie every other hole! Behind them Kevin Freeman (Stoke Park) was having a much closer game, but was never behind and finally won 2 up. Craig Buttivant (Gerrards Cross) was also scoring exceptionally well and he was 6 under par when he won 6/5. Clive Bowler (Oxford City) and Steve Barwick (East Berkshire) were always comfortably ahead in their games and they both won easily. Lee Gauthier (East Berkshire) had the hardest game of the afternoon and was two down with three to play before he took the 16th and with an immensely long drive at the 18th set up a winning position that enabled him to halve his game and left the team with a win by 11½-½. We now go on to play Hampshire for the Daily Telegraph Salver; this is a repeat of last year’s match at Moor Park that was rained off after a few holes. It will be played at South Beds Golf Club on October 20th and we hope the weather will be kinder to us this year and will enable us to win the Salver outright this time. Team at Orsett : David Addison (West Berkshire), Steve Barwick (East Berkshire), Clive Bowler (Oxford City), Craig Buttivant (Gerrards Cross), Kevin Freeman (Stoke Park), Lee Gauthier (East Berkshire), Tom Lawson (Ellesborough), Stephen Lewton (Woburn). The County side played Sonning Golf Club on Saturday 6th July and despite losing the foursomes 3-1 staged a great comeback and took the singles 5½-2½ to win the match by a single point. Team at Sonning: Paul Barrow (Studley Wood), Jon Carter (Reading), Mike Forde (Calcot Park), Darren Gatward (Calcot Park), Ian Manning (Tadmarton Heath), David Palmer (East Berkshire), Martyn Palmer (East Berkshire), Austin Siggers (Studley Wood). After a short summer break, the County went on to play Goring and Streatley Golf Club on Sunday 8th September. The morning foursomes gave us a 3-1 lead at lunchtime but this time it was the Club that staged the comeback and took the singles convincingly 7-1. Six of the games went to the 17th or 18th but all in favour of the home side resulting in a win for the Club 8-4. Team at Goring & Streatley: Paul Barrow (Studley Wood), James Carpenter (Calcot Park), Brian Davies (Parasampia), John Field (Buckingham), Darren Gatward (Calcot Park), Alex James (Buckingham), Paul Lines (Windmill Hill), Steve Webb (Hadden Hill). The next match took the Team to Frilford Heath Golf Club on Sunday 22nd September where in a very tight encounter the County took the foursomes 2½-1½. The afternoon singles were shared 4-4 which left the County side taking the honours, once again, by just a single point. Team at Frilford Heath: Leon Beer (Goring & Streatley), Jon Carter (Reading), Paul Chana (Reading), Brian Davies (Parasampia), Wayne Dobbins (Bicester), Mark Greenwood (Hadden Hill), Andrew Mason (Tadmarton Heath), Martyn Palmer (East Berkshire). The last match of the season took place at Calcot Park Golf Club on Saturday 12th October with the home side taking the foursomes 2½-1½ and with the singles once again finishing 4-4 the Club took the match 6½- 5½. Team at Calcot Park: Leon Beer (Goring & Streatley), Jon Carter (Reading), Paul Chana (Reading), Mark Greenwood (Hadden Hill), Paul Heselden (Harewood Downs), Richard Lee (Goring & Streatley), Matthew Randell (Reading), Steve Webb (Goring & Streatley). The Colts went to Bedford & County Golf Club for their third League Match against Bedfordshire on Saturday 27th July. Although the team was not quite at full strength we were still able to field a side whose combined handicaps amounted to minus 1 and on paper, was considerably stronger than the Bedfordshire side. The morning foursomes got off to a perfect start with all the pairings making fast starts and being well up after nine holes. The best result came from Lee Gauthier (East Berkshire) and Andrew Sheffield (Brailes) who won 7/6 although none of the other games were close. The afternoon singles were bound to be more competitive as the Bedfordshire team looked to salvage some pride after the morning loses. As the games came through 5 holes we were down in three, up in three and all square in two. After 10 holes this had changed slightly in our favour as were now up in four games. As the afternoon temperature rose, so did the quality of golf and the players quickly finished off their opponents and Barry Mann (Frilford Heath) had the honour of collecting the winning point that took the match. Knowing we had won inspired those who had been down in their games and both David Addison (West Berkshire) and Ashley Walton (Frilford Heath) reversed their midway deficits and clinched wins. The emphatic victory by 11½-½ almost ensures the League title as our final match is against Hertfordshire, who are the only team who can catch us and this only if they score 19½ points from 24. This match takes place at East Berkshire on 17th August. Team at Bedford & County: David Addison (West Berkshire), Lee Gauthier (East Berkshire), Matthew Haddy (Bicester), Stephen Lewton (Woburn), Barry Mann (Frilford Heath), Steve Richards (Chartridge Park), Andrew Sheffield (Brailes), Ashley Walton (Frilford Heath). The Colts played their last League Match against Hertfordshire on Saturday 17th August at East Berkshire. On a blisteringly hot day the quality of the golf in the morning did not quite match the weather and the expected lead after the foursomes did not materialise. Once again Ashley Walton (Frilford Heath) and Barry Mann (Frilford Heath) made a comeback and won their game on the last green. Steve Richards (Chartridge Park) and Matthew Haddy (Bicester) never looked in trouble and eased home by 2/1. This left the match tied at 2-2 at lunch and although we could afford to lose the match and still take the League Title, the players made a determined effort in the afternoon singles and after 6 holes we were ahead in 6 games, level in one and just one down in the other. After 12 holes the situation had changed little and a victory looked very much on the cards. In quick succession the points came in led by Lee Gauthier of the home club securing a convincing 5/4 win, followed by Steve Lewton (Woburn) winning 2/1 with Matthew Haddy (Bicester) and Barry Mann (Frilford Heath) both winning comfortably. This left the match, at worst, drawn and the League had been won. Nonetheless the players continued to try to win and Ashley Walton again came from behind to earn a gallant half at the last. David Addison (West Berkshire) was engaged in an epic duel and after numerous birdies closed out his game 1 up. The traditional anchor men of Steve Richards (Chartridge Park) and Andrew Sheffield (Brailes) were never down in their games and both took their points with 2/1 victories. A fine end to the season with a 9½-2½ match win saw the side take the League Title by a wide margin for the third year in a row. Undefeated in this time it would be nice to close out the season with a win against the South of the Thames winners at Littlestone in October. Team at East Berkshire: David Addison (West Berkshire), Matthew Haddy (Bicester), Lee Gauthier (East Berkshire), Stephen Lewton (Woburn), Barry Mann (Frilford Heath), Steve Richards (Chartridge Park), Andrew Sheffield (Brailes), Ashley Walton (Frilford Heath). Team at North Oxford: Adam Birdseye (Hazlemere), Haydn Brooks (Woburn), Sean Cooke (Henley), Carl Corbin (Wokefield Park), John Cronly (Frilford Heath), Laurence Eltham (Goring & Streatley), Mark Hall (Oxford City), Ben Harwood (Hazlemere), Adam Hinkins (Chiltern Forest), Nick Howell (Goring & Streatley), Andrew Mason (Tadmarton Heath), Chris Tellett (Woburn). Next match for the Juniors was against Bedfordshire at Aylesbury Vale on Friday 16th August and we decided to give a number of our younger players an opportunity against a strong Bedfordshire side. Although disappointed with the result at losing 2-13 we hope the players will benefit from their experience. Team at Aylesbury Vale: Adam Birdseye (Hazlemere), Haydn Brooks (Woburn), John Cronly (Frilford Heath), Laurence Eltham (Goring & Streatley), Mark Hall (Oxford City), Ben Harwood (Hazlemere), Adam Hinkins (Chiltern Forest), Nick Howell (Goring & Streatley), Michael Joy (Hazlemere), Andrew Mason (Tadmarton Heath). The Juniors then went on a short tour to Norfolk as we had failed to qualify for the EGU/SE Group Junior Foursomes competition. The first day, Tuesday 20th August, saw them practice at Hunstanton in readiness for the match against Norfolk the following day. In a testing ‘breeze’ some of the players found it difficult to control their shots but they learned a great deal and put it to good use the following day as they took on the Norfolk Team. The morning foursomes went very well and the side never lost a game and went into lunch 4-1 up. The afternoon singles were much tighter and most games went to the last two holes. Although losing the singles 4½-5½ we took the match overall 8½-6½. 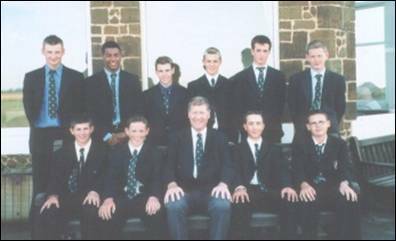 The team then went on to Sheringham along the coast to compete in their Junior Open for the Duffield Cup. With a number of the Norfolk side from the day before competing, it was pleasing to see two BB&O players taking the top two positions. Mark Hall (Oxford City) and Haydn Brooks (Woburn), tied on 73 but Mark was awarded first place on countback. Team at Hunstanton & Sheringham: Adam Birdseye (Hazlemere), Haydn Brooks (Woburn), Carl Corbin (Wokefield Park), John Cronly (Frilford Heath), Mark Hall (Oxford City), Nick Howell (Goring & Streatley), Michael Joy (Hazlemere), Peter Lane (East Berkshire), Andrew Mason (Tadmarton Heath), Craig Taylor (Woburn). Haydn Brooks (Woburn) receiving the Busby Bowl from Bob Stewart. 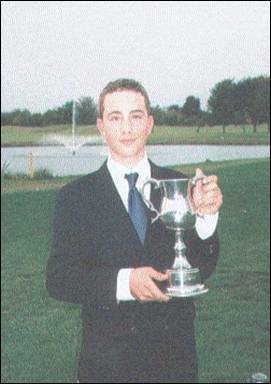 The BB & O Boddington Trophy was played at Oxford City Golf Club on Wednesday 14th August. Disappointingly, just 30 players entered this event for players over 25 and with a handicap on 7 and below. With an estimated 3,000 players eligible to compete within the three counties it is surprising that more did not enter and enjoy a great value day’s golf, in glorious weather on a well presented golf course. The field mainly consisted of players of 5 handicap and below and the morning scoring was excellent as a third of the scores were to handicap or under. Leading the way at lunchtime was local player Larry Holder whose 1 under par 69 was one better than Craig Buttivant (Gerrards Cross) and Clive Bowler, another local, just one shot further back. Also within striking distance were Darrell Robertson (Windmill Hill) and Chris Norman (Flackwell Heath) both of whom had very creditable scores of 72. The afternoon was very warm and Brian Davies (Parasampia) and John Summers (Oxford City) both scored 71 to set the early mark at 147 before Paul Lines (Windmill Hill) took the lead on 145 after a 72. 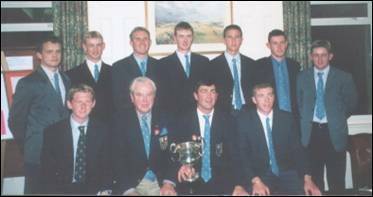 Clive Bowler and Craig Buttivant were playing together in the last group and it seemed likely that the title would go to one of them. After nine holes Craig Buttivant, the defending champion, had increased his lunchtime lead to 3 shots despite his playing partner’s one under par front nine. He had three birdies to be out in an impressive 32 shots and it was not until the 11th that the gap was closed when he dropped a shot. However successive birdies from Craig once again opened the margin to three shots before Clive lost any chance by taking 6 at his 14th hole. Finally finishing the back nine in level par enabled Craig to successfully defend his title and take the Trophy by a comfortable 4 shot margin from Clive Bowler, with Paul Lines a further 4 shots back in third place. The BB & O Autumn Trophy was played at Chipping Norton Golf Club on Wednesday 18th September. The field of 45, once again, consisted mainly of players of 5 handicap and below and it was disappointing that we did not have a full field for this event. The morning scoring was excellent with 8 players at par or better. Heading the field at lunchtime was Stephen Richards (Chartridge Park) who had five birdies in his 67 making 4’s at all three par five holes and his score equalled the course record. In contrast David Addison (Parasampia) made his 4 birdies at par four holes and settled for a 68 and a tie for second place with Richard Lee (Goring & Streatley) who had also played extremely well for his 3 under par score. 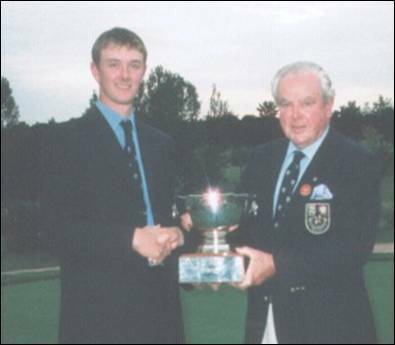 With Ashley Walton (Frilford Heath) scoring a 70, the sub plot for the Order of Merit Trophy was intriguing as Ashley had to finish in the top 5 to secure the title and his only main challenger after the morning round was David Addison. The afternoon scoring improved as the players had acquired some ‘local knowledge’ and a fantastic 65 from Darren Gatward (Calcot Park) saw him claim the course record by 2 shots. Unfortunately his morning round score would only enable him to finish in a tie for 3rd place with Richard Lee who added another creditable 72 to his morning round. Local player Danny Hicks produced another fine round as he had 6 birdies in his score of 68. Meanwhile Stephen Richards and David Addison were battling it out on opposite sides of the course and after nine holes the players were tied at 4 under par as David had picked up two shots by finally getting under par on a par 5 with a wonderful eagle three at the 6th. Stephen regained the lead as he made successive birdies whilst David maintained par figures, however two dropped shots from Stephen on the 6th & 7th meant that David was now one ahead and he capitalised on this with a birdie on the 16th .The three shot swing on the 6th would prove crucial as Stephen was unable to find the birdies he need in the last two holes and David Addison took the title with an excellent 6 under par total and by a two shot margin. 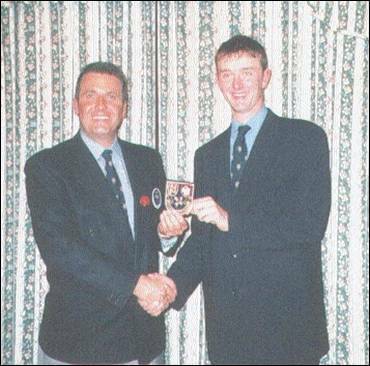 His 10 Order of Merit points also enabled him to clinch this title as Ashley Walton was not able to finish in the points. Meanwhile in the handicap event 4 players tied on 136 with Tony Keyes (Magnolia Park) taking the prize on countback from Richard Lee (Goring & Streatley) and John Balague (Forest Downs). 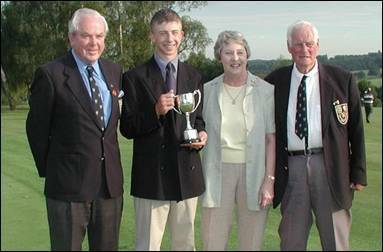 The highly competitive nature of the Order of Merit Trophy saw three players in with a chance of lifting the title at Chipping Norton. David Addison (Parasampia) clinched the Trophy with an impressive win that emphasised his good form throughout the season. Calcot Park and Bird Hills Golf Clubs met in the 11th Hillman Trophy Final at Reading Golf Club on Saturday 19th October. Play is over 18 holes singles matchplay for a seven man team, with each team having three players in handicap range 6 to 9 and four with a handicap of 10 and over up to a maximum of 20. 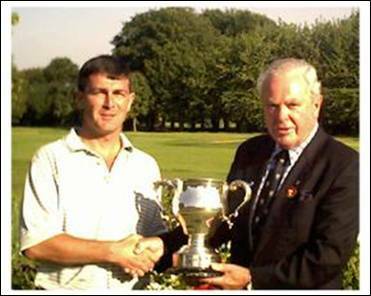 Named after a Past President of BB & O and member of Ellesborough Golf Club, the late Jim Hillman, the competition has proved a popular and competitive event for handicap golfers. Both teams had brought many supporters and it was good to see such and interest in the Final. Calcot Park were determined to take the Trophy and they played some wonderful golf that no matter how hard they tried, could not be matched by the Bird Hills side who were delighted just to have got to this stage. Calcot Park were in command throughout the day and finally came out winning 6½-½. Calcot Park Team: Andy Willis, Simon Powell, Terry Bell, Peter Honey, Tony Coleman, Trevor Pembroke, Keith Hanson. Bird Hills Team: Max Barker, Colin Webb, Dave Hester, Steve Gerring, James Morris, Kevin Barker, Paul Webb. Played on the same day as the Trophy Final, Temple and East Berkshire Golf Clubs contested the Plate Final at Calcot Park Golf Club. In a much tighter contest the first three games went in favour of Temple before East Berkshire took the next three to even up the match. In an exciting finish Miles Pendle of Temple finally took his game 3/2 to ensure victory by the narrowest of margins in this the 8th Plate Final. A record total of 82 Clubs from the BB & O took part in this event played over the past six months. Our thanks to the neutral Clubs that hosted the Finals and to all the teams for playing in such a friendly yet competitive manner. Temple Team: Chris Milne, Mike Fabb, Jamie Milne, Graham Pearce, Jethro Tull, Richard Rome, Miles Pendle. East Berkshire Team: Stan Turner, Andrew Cousins, Len Amor, Les Sumner, Archie Mackie, Tony Brown, Ron Franklin. 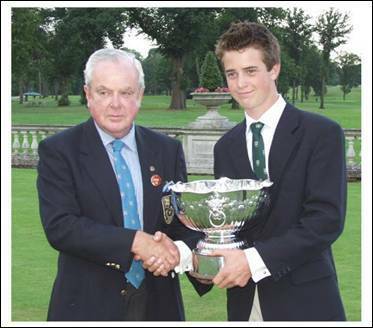 The BB & O Boys 14 years and Under Championship was played at Bicester Golf & Country Club on Tuesday 22nd October. There was an entry of 46 boys for this Championship which was down on last year due to the fact that the Berkshire schools half term was put back a week. Due to the difficulty of playing more than 27 holes at this time of year, the field is split, so that the higher handicaps have a morning coaching session with PGA Professionals and then play 18 holes Stableford for separate prizes from the main event. This again proved most popular and all the boys felt they benefited from their coaching. Despite the heavy overnight rain the course stood up well and the scoring was quite good in the morning and there were five players within 5 shots of the leaders Anthony Sage (Gerrards Cross) and Craig Taylor (Woburn). A number of boys improved in the afternoon 10 hole round and both Joe Cronly (Frilford Heath) and Craig Drew (Studley Wood) played steadily to set a good target. In an exciting finish Anthony Sage could not quite get the birdie he needed in the last three holes to tie Craig Taylor who took the Title by just one shot with Joe Cronly in third place as Dean Wright (Goring & Streatley) took the main prize in the handicap event. Buster Evans (Sand Martins), after a terrific afternoon score, took 2nd on countback in the handicap from Eddie Pepperell (Drayton Park). The Stableford for the higher handicap players was closely contested with Nick Craigen (Frilford Heath) just taking the honours with George Wilson (Woburn) and Steven Park (Goring & Streatley) one point behind. All the boys enjoyed the golf and it was pleasing to see that there were no ‘no returns’ and that everyone changed and stayed for the presentation after tea. 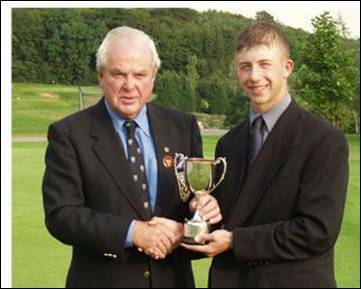 The BB & O Douglas Johns Trophy was played at Harewood Downs Golf Club on Thursday 1st August. This Open event is contested by players aged 16 years and under from all over the Country, with one competitor coming from as far away as St Ives. This is the tenth time the event has been held and there was an excellent field of 60 from 49 different clubs. The status of the event has risen to such an extent that 120 players entered and the ‘cut’ for entry was 5.9 with 54 players of 5 handicap and below. England Boys selectors were on hand to witness golf of such a high calibre that par and sub par rounds were commonplace over the tight par 69 course. Mark Hall (Oxford City) set the early pace with a 68 before Daniel Taylor (Woburn) and Grant Slater (Carlyon Bay) matched this later in the morning. At lunch 4 players were within three shots of the leaders and the afternoon promised an exciting finish. As the afternoon progressed scoring was exceptional and 17 players would eventually score 71 or better and Jak Hamblett (Handsworth) had a 1 under par 68 and set the mark at 138, level par. Grant Slater and Oliver Turnill (Bognor Regis) were playing together and both were 1 under after nine before Oliver went ahead with two more birdies on the back nine before just missing a short birdie putt on the 18th to equal the course record. Meanwhile Daniel Taylor, playing the course from the 10th, had reached the turn in 3 under par and would pick up another shot on his 15th hole. Now 3 shots clear of his nearest rival a dropped shot at the 8th was compensated with a wonderful birdie to finish and a course record equalling 65 saw him take the Trophy with a fine 5 under par total. This was also a record low score for the event beating the previous best by 2 shots. Daniel received his Trophy from Lesley Clarke, daughter of the late Douglas Johns and the minor prizes were presented by Rex Hepburn (Newbury & Crookham) who has been Tournament Administrator since the Trophy’s inception. Rex now stands down after 10 years and we thank him for his hard work in running the event. The English Golf Union Southern Counties Seniors’ Foursomes. The Seniors played their Preliminary round matches at Copthorne Golf Club on Thursday 15th August. Drawn against Hampshire in the morning they were anxious to gain revenge after their defeat in last year’s final. Hampshire took the early advantage winning the first game before Ken Proctor (Burnham Beeches) and Duncan Forbes (Sonning) squared the match, winning on the last green. 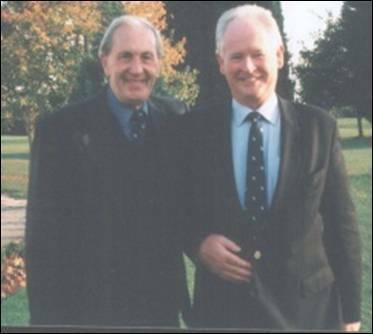 A win for Hampshire was countered with another last hole win by Rod Crisp (Ellesborough) and Peter Franklin (Stoke Park), leaving the match to be decided by the result of the last game. Fortunately, Peter Batchelor (Woburn) and Anthony Parson (Denham) were in fine form and were in total command as they came out winning 4/2. The Preliminary Final took place against Surrey, who had earlier defeated Sussex 3-2. This time we got off to a better start as David Lane (Goring & Streatley) and David Doodson (Temple) took their game 5/4. Although losing the next, we were in command in two of the remaining games and Bryan Claringbold (Frilford Heath) and Brian Berney (Gerrards Cross) quickly produced another point winning 4/2. Rod Crisp and Peter Franklin gained a comforting half as Peter Batchelor and Anthony Parsons continued their excellent play before winning by the wide margin of 6/5. The team now go on to play in the Finals being held at Cotswold Hills in October. 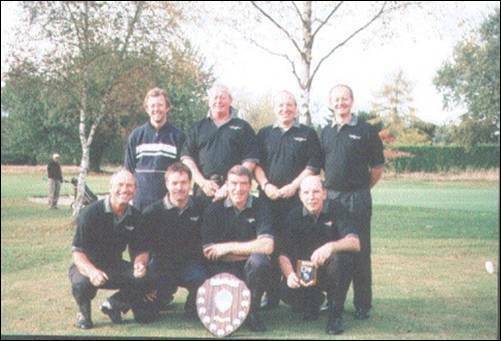 Team at Copthorne: Peter Batchelor (Woburn), Brian Berney (Gerrards Cross), Bryan Claringbold (Frilford Heath), Rod Crisp (Ellesborough), David Doodson (Temple), Duncan Forbes (Sonning), Peter Franklin (Stoke Park), David Lane (Goring & Streatley), Anthony Parsons (Denham), Ken Proctor (Burnham Beeches). The Seniors having won their Preliminary round matches at Copthorne Golf Club went to Cotswold Hills Golf Club on Monday 14th October for the Finals with Norfolk, Middlesex and Somerset making up the other finalists. Drawn against Middlesex in the morning and in very damp and misty conditions the team seemed ill at ease and only Rod Crisp (Ellesborough) and Peter Franklin (Stoke Park) were in command in their game. Fortunately David Lane (Goring & Streatley) playing with David Doodson (Temple) and Ken Proctor (Burnham Beeches) playing with Duncan Forbes (Sonning) both came back to win having lost their early advantages after nine holes. This meant that the match for the Title was between BB & O and Norfolk who had beaten Somerset 2½-1½ in the other match of the morning. The team got off to a far better start and Bryan Claringbold (Frilford Heath) and Brian Berney (Gerrards Cross) produced the first point winning 6/5. This result, given the method of deciding the winner in the event of a tie, meant that after David Lane and David Doodson had secured another point, that it was unlikely we could be beaten. Ken Proctor and Duncan Forbes just lost out to a fine par at the last but Rod Crisp and Peter Franklin gained an excellent half to secure the outright win by 2½-1½ and avoid the necessity to decide the result by holes up. Tom Wallis (Ellesborough) was delighted with his team’s performance in which they were undefeated in competitive matches and had won all three titles for a clean sweep of the EGU South East events. 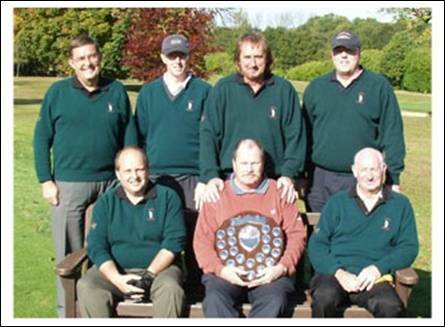 Team at Cotswold Hills: Brian Berney (Gerrards Cross), Bryan Claringbold (Frilford Heath), Rod Crisp (Ellesborough), David Doodson (Temple), Duncan Forbes (Sonning), Peter Franklin (Stoke Park), David Lane (Goring & Streatley), Ken Proctor (Burnham Beeches). Team at Sonning: Peter Batchelor (Woburn), Brian Berney (Gerrards Cross), Bryan Claringbold (Frilford Heath), David Doodson (Temple), Tony Finch (Flackwell Heath), John Gill (Sonning), David Hearn (Ellesborough), Anthony Parsons (Denham), Ken Proctor (Burnham Beeches), Jim Walkinshaw (Denham). Having been undefeated in the North of the Thames League the Colts, managed by Craig Buttivant (Gerrards Cross), took on the South of the Thames League winners Kent at Littlestone Golf Club on Saturday 12th October. This was always going to be a difficult match as the EGU South East Group Finals are played on a rota basis and Kent had a distinct home advantage as Littlestone is one of their best courses and used for their Winter training programmes. Given that ‘links’ golf is unknown in BB & O it was not surprising that the foursomes went in favour of Kent and we trailed by 3-1 at lunchtime with just Barry Mann (Frilford Heath) and Ashley Walton (Frilford Heath) getting the better of their opponents. The afternoon singles pairings looked interesting as the Kent Manager had done a ‘Torrance’ and put his best players at the top of the field. However, things would not work out quite as planned for Kent and some inspired play from David Addison (Parasampia), Ashley Walton (Frilford Heath), Steve Richards (Chartridge Park) and Robert Christian (Beaconsfield) took the Colts into 5-4 lead in the late afternoon. With three games left on the course and being down in two it required some steady nerves from Matthew Haddy (Bicester) to finally overcome his opponent on the 17th green and to leave the match tied at 6-6. Under the rules the Daily Telegraph Salver will be shared for 6 months by each County Union, but the team can feel well satisfied with their performance as on an ‘away goals’ basis the draw was a moral victory. 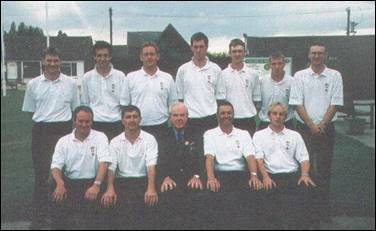 Team at Littlestone: David Addison (West Berkshire), Robert Christian (Beaconsfield), Matthew Haddy (Bicester), Lee Gauthier (East Berkshire), Barry Mann (Frilford Heath), Steve Richards (Chartridge Park), Andrew Sheffield (Brailes), Ashley Walton (Frilford Heath). Having been undefeated in the North of the Thames League, the County captained by Matt Briggs (Frilford Heath), took on the South of the Thames League winners, Hampshire, Isle of Wight & Channel Isles, in a repeat of last year’s final, at South Beds Golf Club on Sunday 20th October. Having shared the Daily Telegraph Salver last year when appalling weather at Moor Park prevented any play, both sides were determined to complete the match on a day when the weather forecast promised torrential rain. Fortunately the South Beds course is free draining and was in excellent condition and a full day’s play looked probable. The morning foursomes got off to an excellent start with us taking three of the four games with Tom Lawson (Ellesborough) and David Addison (Parasampia) notching up another victory. Kevin Freeman (Stoke Park) and Stephen Lewton (Woburn) combined well to beat the very strong Hampshire pairing and Steve Barwick (East Berkshire) and Craig Buttivant (Gerrards Cross) were easy winners after some excellent golf. We felt confident going into the singles with a 3-1 lead at lunchtime but as the afternoon progressed and the weather worsened we struggled to take a lead in any of the games. Soon it was becoming apparent that the best result we could hope for was a draw as we were up in three games and well down in the remaining five. In fast fading light we could only convert one of these into a win as Kevin Freeman (Stoke Park) closed out his game before Mark Housego (Wycombe Heights) and Tom Lawson (Ellesborough) settled for halves to leave Hampshire as worthy winners by 7-5. 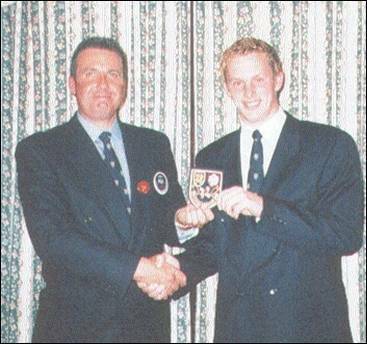 A disappointing end to yet another highly successful year under the Captaincy of Matt Briggs who was presented with a small token of appreciation by Steve Barwick (East Berkshire) on behalf of his Team. 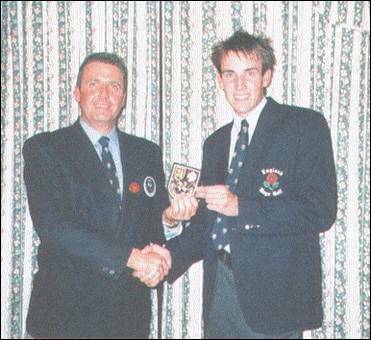 Craig Buttivant now takes over as County Captain and is looking forward to continuing our successful League results. Back Row: Steve Barwick (East Berkshire), Clive Bowler (Oxford City), Tom Lawson (Ellesborough), David Addison (Parasampia). Middle Row: Ian Godleman (Coach), Kevin Freeman (Stoke Park), Stephen Lewton (Woburn), Paul Cook (Coach). Matthew Briggs (Captain), Craig Buttivant (Gerrards Cross).